Houses in the Dunes, n.d.
Oil on panel, 26,5 x 31 cm. With distinctive, alternating broad and pointillist brushstrokes, van Goyen has painted the anatomy of an overcast day. The light, cloudy sky, the gnarled consistency and muddy ruts of the field, the low, rustic buildings and leaning windbreak between the trees. 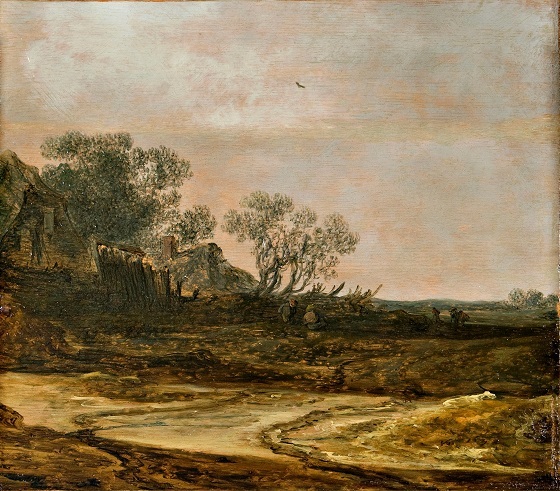 Van Goyen was a proponent of so-called tonal painting, where the palette was held in homogenous colours, such as the grey, grey-greens and golden-brown nuances here. The painting’s style is transparent and sketch-like, which is further emphasised by the visible chalk lines from the original sketch carried out directly on the wooden panel. The overall impression produces a vibrating sense of atmosphere that is characteristic of van Goyen’s style and expression. The tonal painters were important frontrunners for modern Realism and the Impressionists. Van Goyen is one of the finest representatives of the strand of landscape painting that focused intensely on the aerial perspective. His subjects are unique for their sketch-like painting style with a limited palette, often in golden-brown nuances, known as tonal painting. His studies of light and air would later become sources of inspiration for the Impressionists in the 1800s. Throughout his 35-year career, van Goyen produced more than 1200 paintings and at least that many drawings, including hundreds of nature studies carried out during his many walks around The Netherlands.